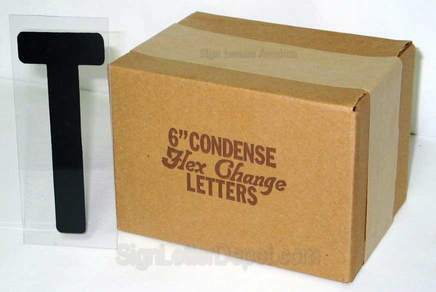 Open Box sets are returned items which the buyer bought the wrong size or type of letter. Some may show light scuffing from rubbing together during shipment or may be un-sorted from being taken out of box and re-packaged. Set of approxamitly 250 Condensed Flex Change letters. Our 6" Flex Change Letters are printed on 6 7/8" tall clear UV protected plastic back .030 mil's thick or about as thick as a credit card. Condensed style letters are narrower than block letters allowing you to fit more letters on your sign. Flex letters are not designed to replace Rigid type lettering including Gemini Pronto. Rigid letters use tracking called "Push up drop down track". Refer to the following article for more information on determining the different types of letters.